After years of improving and testing, Razor increased the over all performance of the Razor R4 significantly by tuning the bevels. 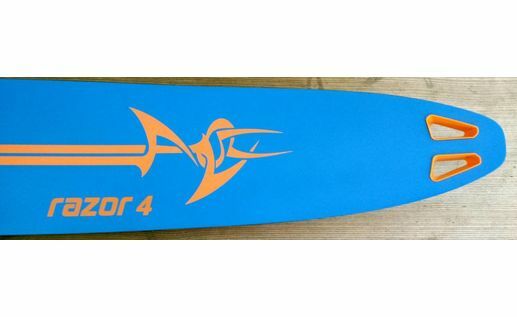 The Razor R4 now rides higher on the water when on edge. This "riding higher on the water" is most essential at the end of the turn where the R4 now delivers a super smooth transition into the pull. Which is of paramount importance for a dynamic and smooth performance in all line length and speeds. if taller than 172cm or 5'6" take a 66" // if taller than 184cm or 6' take a 68"
•If you decide to return the ski within the 28 day period please contact us first at +43 699 1585 7759 or e-mail mail.us@hotwater.cc. We need to hear from you latest 21 days after our shipping date. Please insure the ski as hotwater.cc will not be responsible for damage caused during transport. •Once we receive the ski it will be inspected. After clearing inspection you will receive the refund. Damages will be deducted. All freight costs are non-refundable. •Use only provided original metric screws to attach bindings and take extra care not to cross thread. •Please follow binding, fin and wing position recommendations that come with your RAZOR. •All RAZORs must be returned with the original packaging and hardware. 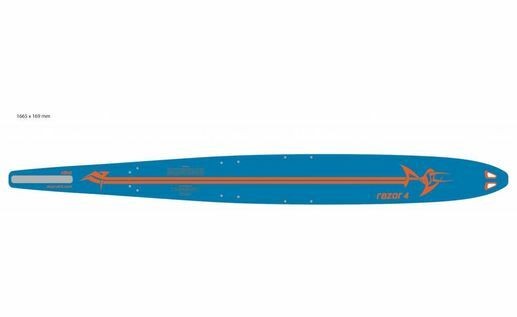 fin setting 64" 66" 68" 64" 66" 68"
short line depth 62,7mm 62,8mm 62,9mm 2,469" 2,472" 2,476"
binding placement 64" 66" 68" 64" 66" 68"
Distance from heel of front binding to tail of the ski. Firmly tighten and control all screws, do not use more than 0.6 Nm torque at the M4 metric bolts. Use RAZOR metric tools and bolts only. Outstanding performance. Fast. Wide. Sharp turns. Love it. Best ever.